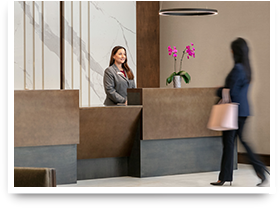 From corporate meetings to social gatherings, the Crowne Plaza Philadelphia - King of Prussia is the premier hotel in the King of Prussia Area. With over 24,000 square feet of flexible meeting space, including spacious pre-function space and an on-site audio-visual production company, The Crowne Plaza Philadelphia - King of Prussia is undoubtedly the place to hold your next meeting. Our skilled staff, of course! With our team of talented professionals, we have established our hotel as a market leader both in customer service and culinary expertise. In an effort to create a positive and productive meeting experience, we offer both a Crowne Meeting Director (CMD) and a Crowne Meeting Manager (CMM), which will serve as your main point of contact for all aspects of your program, including room reservation updates, menu selection, and audio visual requirements and meeting room setup. Your CMD/CMM will be on-site and available for immediate response at all times.